In the second half of our December chapter meeting, Mr. Joseph Tomei of Kumamoto Gakuen University discussed the use of surveys as an integrated component for language acquisition and practice. This post will cover some of the ideas that were covered during the second talk. Both move from general to specific. Both require an awareness of response given. Both work best when they build to a purpose. Both work much better when a participant wants or needs some particular information. As an aside - Joe revealed that ideally for him the perfect number of students in a classroom is 24 students. This allows for pairs, groups of three, groups of four, groups of eight - these are nice and even. Reality suggests this rarely happens. One idea is to use an 8 question 1-Day survey: 3-4 yes/no questions, 4-5 multiple choice questions and a spreadsheet for the data collection. The number of required students for interview is twenty. Give the students all the proper tools to make the lesson organized and easy to follow. Once the scaffolded lesson or lessons are complete, then move on to a more major project - the scaffold is effectively removed. One note is that all of the group work gets shoved outside of class time in order to force student collaboration outside of the classroom. There are challenges in motivating some individuals and groups. The final presentation format is poster-presentation style. 4 presentations happening simultaneously in the same room and groups rotate to view each presentation. This means the students do their presentation 4 times. One technology note is that Joe makes extensive use of the Google Docs and Forms for making graphics and posters. 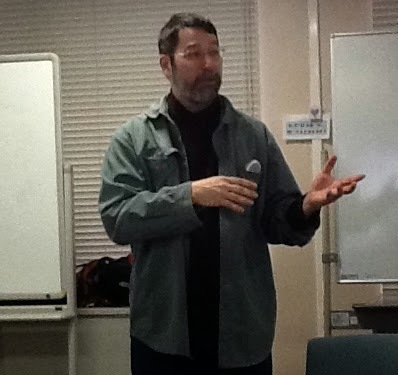 Joe also took a few minutes to promote the Special Interest Groups which are a part of JALT. In May of 2014, the PanSIG conference will take place. This is a chance for all of the SIG members for all of the SIGs to get together in one place. The conference will have interactive presentations and poster presentations and each SIG will have a chance to hold a forum. There are three plenary speakers planned. The theme is "Sustainability: Making Teaching and Learning Last." The exact date is May 10th, 2014 and it will be held in Miyazaki. The call for presentations at PanSIG 2014 is at http://www.pansig.org/2014/call.html. There's a twitter account (@pansig2014) to follow and a Facebook (https://www.facebook.com/pansig2014) page to 'Like'. The hashtag for PanSIG in 2014 is #PanSIG2014. Joe is also the SIG coordinator for the Teachers Helping Teachers SIG which has a webpage at http://www.tht-japan.org/. THT organizes yearly conferences in Laos (Feb-Mar), Vietnam (early Aug) Bangladesh and Kyrgyzstan (both in Sept). If you'd like to participate, please feel free to contact him for more details.